Henley and Stourport in One Weekend! 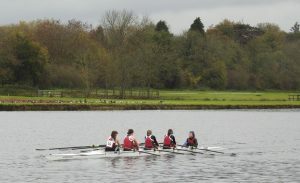 On Saturday 4th November, a large Junior contingent from Stratford upon Avon Boat Club competed over 3km in the Henley Long Distance Sculls. Raced over an extended Henley Royal regatta course, the event is attended by many of the top clubs and schools in the country. 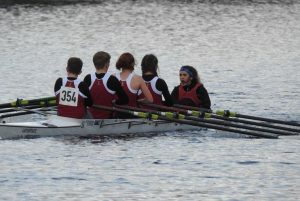 Junior athletes ranging from J14 to J18 represented Stratford over two divisions with a strong headwind early on presenting challenging conditions for competitors. The event, a major competition on the pre-Christmas winter racing calendar attracted almost 600 entries primarily from the London and the south east areas of the country, providing very high levels of competition for Stratford crews throughout the day. This event was a step up on anything the Junior Squad have done before especially for two Stratford J14 quadruple sculling crews who enjoyed a good row and gave a good account of themselves. The J14 girls’ crew of Elisabeth Edwards, Sienna Rawlings, Sophie Elstone, Abbey Meggeson coxed by Mary Walton finished sixth of twelve boats and in the Open category, a mixed crew of Amelie Sartain, Harriet Hodgson, Will Clarke, Conar Aitchison coxed by Julia Zampronio Gurden produced a good time to finish third against four other all boy boats. There were some strong performances across the older age groups with both J15 (Dan Cox and Max Griffiths) and J16 (Fred Tyler and Joe Hodson) boys’ double sculls achieving good results with each finishing sixth in fields of sixteen and seventeen respectively. J16 girls also produced some excellent sculling with Emily Browne, Jessica Wiesheu and Katie Wellstead finishing fourth, eighth and ninth respectively in single sculls and Molly Gill-Swift and Khloe Curnock achieving a very good time to finish fourth in large high quality field of twenty one double sculling boats. Stratford boats competed well in other categories including J16 Geoffrey Flambert (24th) and WJ15’s Nixie Brunt (8th) and Jasmine Mountney (10th) in single sculls and Maiya James, Mili Wilcock, Mya Kenny. Alice Baines and Naomi Sergeant in a J15 girls quadruple scull (13th) and Theo Mordaunt, Claire Teakle, Maddie Griffiths and Sofia Ward in a J18 coxless quad (10th). Meanwhile, a change in the weather from a glorious late autumnal week of sunshine and mild temperatures to cold and continuous rain greeted Stratford’s Masters’ Squad as they also competed in the Henley Long Distance Sculls Head. First up for the Masters Squad saw a head to head between Neville Hand and Gary Clay against Kjersti Woolley and Thomas Doherty in Masters E double sculls .With no mixed event Kjersti and Tom were rowing in the Men’s event but still gave Neville and Gary a good fight just being overtaken at the finish. The good row by Gary and Neville saw them just fail to take the overall winner’s prize by seven seconds to Bradford on Avon in a time of thirteen minutes thirty eight seconds with Kjersti and Tom finishing in fourteen minutes and twenty eight seconds. 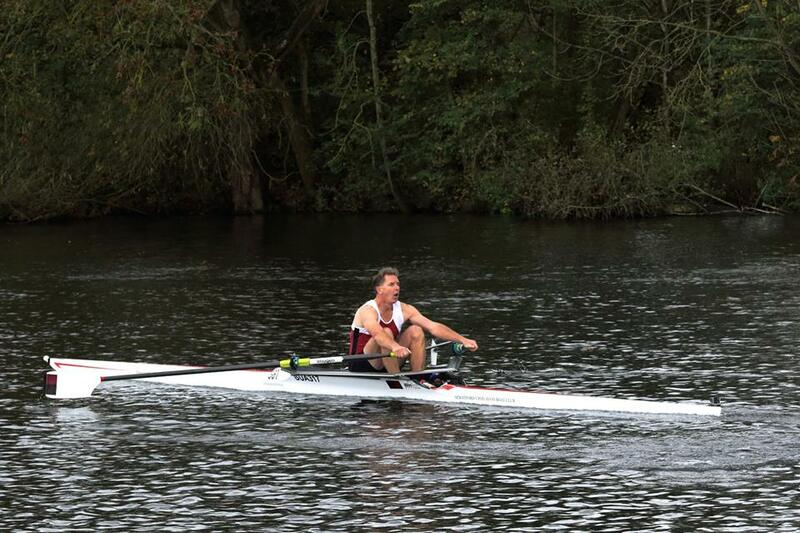 The afternoon division saw Tim Lunel competing in the very competitive Masters D single sculls event in a field including former Olympian Guy Pooley. Tim produced a very good row to finish in a time of thirteen mins and fifty six seconds and an overall midfield position of sixth. It remained for Christine Goodwin to complete the Masters’ entries racing in Open Women’s second level sculls. In a strong field of eleven competitors, Christine put in a greatly improved performance from last year to finish again midfield in a time of fifteen mins fifty two seconds in seventh position. A change of river for the Masters’ Squad on Sunday for Stourport Small Boats Head saw a much needed improvement in the weather with sunshine, higher temperatures and local competition making for a good days racing over a 4km stretch of the Severn. With a following wind and a positive stream fast times were the order of the day. 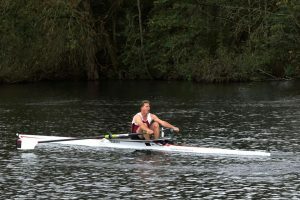 For more great pictures of Henley Long Distance Sculls, see Stuart Baines’ selection https://1drv.ms/f/s!AiW2DAyn9tg9jIIGqT0pAxsBXLuLNA. Stratford Town Trust for helping to fund boats and equipment. NB: River Status is only a guide and may be out of date - senior members and coaches are responsible for assessing risk before boating.